"Copper Creek was excellent! They arrived when they said they would and performed all the services quickly. Quality of work was great and we would definitely call them again for any electrical work." "I highly recommend John and his team at Copper Creek for any electrical work you need done around the house. Anything from changing/installing light fixtures to full kitchen remodel work, you won't be disappointed." "I called Copper Creek Electric to fix my problem. Someone answered the phone immediately when I called, and they scheduled a service visit for the very next day. They arrived on time and fixed the problem right away. Everyone was terrific--from the person who answered the phone to the two guys who came the next day. I couldn't have been more pleased with their professionalism and the way I was treated. 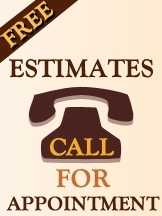 I will definitely call them back again when I have any electrical issues!" "I needed help with a doorbell that was not working properly. The wire connecting the transformer to the doorbell must have had a short. John Simonsen with Copper Creek responded to our request for assistance. He was on-time and quickly identified the problem. He quickly re-routed a spare wire to solve the problem. Overall, an excellent job! On time. On budget. Very quick resolution." "John was easy to get in touch with and very flexible with scheduling. He was prompt, courteous and finished the job faster than expected. The outlet and flood lights are working great now. And, the final cost was less than the initial quote! How often does that happen?! I definitely recommend Copper Creek and will be using them again." "The company's owner arrived on time and completed the installation promptly. He was knowledgeable and very professional. After experiences with other contractors in this area, some well-known, it is a pleasure to know that there is a company who can provide a service promptly, courteously, ethically, and affordably. His company requires drug testing and criminal background checks in the hiring process. What a great recommendation! 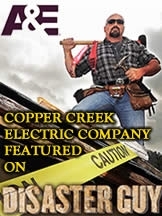 I give Copper Creek Electric an A+!"